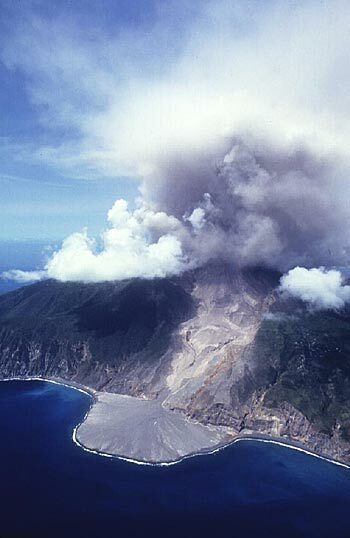 The Soufriere Hills volcanic eruptions on the island of Montserrat. Now she puffs but will she blow? Trust the Lord and pray its no. 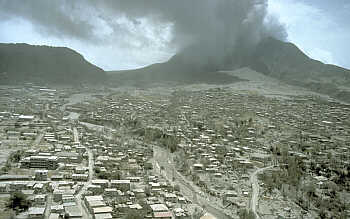 In 1995 the Soufriere Hills volcano erupted pyroclastic flows over much of Montserrat . 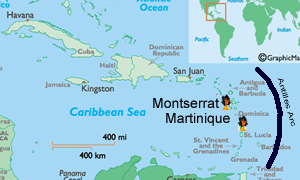 The volcano caused much of Montserrat to be evacuated and left the capital Plymouth destroyed.Montserrat is a small tear drop shaped volcanic island in the Carribbean formed by the subduction of the North American Plate beneath the Caribbean Plate.. The Island is one of the last remaining outposts of the British Empire and before 1995 was called the Emerald Isle. Montserrats active volcano is the Soufriere Hills Volcano topped by Chances peak at 915m (3000ft) and is around 25000 years old . 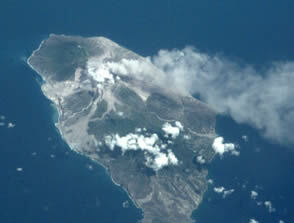 Montserrat owes its existence to volcanic acivity and is part of the Antilles Island Arc. Formed due to the subduction of oceanic crust of the North American Plate beneath the Caribbean Plate in a WSW direction at a rate of 2.2cm/year. As the oceanic plate descends magma is generated whcih gradually works its way to the surface and eventually erupts as a volcano. Andesite,basalt and dacite are the found on the island which indicates that fractional crystallistion has probably occured within a magma chamber to produce the more silica rich melts such as dacite from more Fe rich magma. The Soufriere Hills volcano is a stratovolcano and exudes a very sticky lava called dacite .English's crater on the summit of Chances Peak has been the site of the recent activity since 1995. The crater is 1km wide with walls up to 150m high. The eastern side opens down the Tar river river valley which funnels pyroclastic flows to the sea. Since 1995 a dacitic dome has sat within the crater and regularly produced pyroclastic flows and ash clouds. Instead of rivers of flowing lava "Hollywood style" the dacite forms a plug or dome of lava which pushes up vertically like very sticky toothpaste. As the lava pushes upwards it becomes unstable and collapses. This leads to a volcanic hazard called a pyroclastic flow. 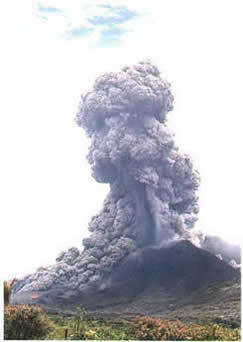 This is a hot avalanche of hot rock,ash,lava and gas which surges down the slopes of the volcano in a billowing grey cloud. The cloud can move at 100mph and you don't stand much of a chance if you are in the way. Most of the gas had escaped from the magma but some remained which caused explosions and eruption clouds of ash up to 40 000 feet. March-September : Pyroclastic flows create new delta of land as they enter the sea from the Tar river valley. Notably on Mothers day! September: First vertical explosion up to 9miles high ejected bombs 1 metre across . Some debris landed over a mile away away. June 25: 19 people killed in a pyroclastic flow as they returned to tend their crops in the exlusion zone. September : Bramble Airport destroyed by pyroclastic flows. Exclusion zone now covers two thirds of the isalnd. Safest area is in the north where 5000 people are living as refugees in their own country. December : Boxing Day eruption: The Dome could no longer support itself and a giant landslide clattered down the White river valley releasing the pressure on the magma below and causing the largest explosion yet. Four sq miles of the island was devasted in 15 minutes. An eruption cloud rose to 36,000feet. January : Only 4000 of the original 11 000 population remain having left for Antigua or the UK.Montserrat more dependent on aid than any other country. July : Dome collapses and eruption clouds rises to 35,000 feet. September : Hurricane George deluges the island with rain causing floods. The rain mixs with ash to form mudflows or Lahars which bury the landscape further. March: Dome collapse causes pyroclastic flow and a large explosion shoots re hot llava fragmenrs hundreds of metres into the air. If you have just read the section above you might think Montsserat was a barren no mans land. It is true to say that the a large portion of the southern part of the island has been covered in ash but the northern part is still very much a beautiful and lush landscape. The Island is only small ( 7 miles North/South and 3-4 East/West at its widest) so you are never far from the volcano. Much of the Island lies within an exclusion zone that was implemented to protect the islanders from the volcano. To the north of this the island is bieng rebuilt and Montserrat is open for business. Montserrats new airport was opened in 2005 and recieves flights from Antigua . Antigua recieves flights from long hau destinations. There is essentially one main road which follows the outside of the island and then has offshoots. You will need a local drivers licence which you can apply for at the airport or a police station ( Salem and Brades ) for £10 or $19. There are only 2 petrol stations. You can always hire a bike if you're feeling fit! Or take a taxi if you're not! Boat trip: Visiting the exclusion zone is not an option for a tourist but you can view the southern half of the island by boat.Trips leave from Little Bay and take in Plymouth,Tar River Valley and the remains of Bramble Airport. You can view the paths the pyroclastic flows took, see how Plymouth has been gradually buried by Lahars and see the new delta at the base of the Tar river valley. Each tour lasts around 2.5 hours. Land based viewing is only within the safe zone. View Plymouth from Richmond Hill. Soufriere Hills and Bramble Airport from Jack Boy Hill in the North East of the Island where there is a telescope and picnic area. Helicopter trips are available from Antigua to view the volcano but not land. Montserrat Volcanic Observatory: The MVO is in Flemmings and is open Monday to Friday and provides displays and information about the volcano. On Tuesdays and Thursdays at 2pm you can meet a geologist from the observatory for a tour of the monitoring station. Day Trips from Antiguas can be arranged as can Volcano Tours on the Island. 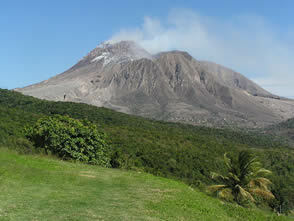 The Montserrat Tourist Board site provides contatc information.